Information trickled out about President Trump’s decision to shrink Bears Ears National Monument for weeks. On Monday, that trickle turned into a flash flood. The president went to Utah to announce his plan to scale back Bears Ears’ 1.35 million acres by 82 percent. He also announced he was shrinking Grand Staircase-Escalante National Monument by 800,000 acres according to the Washington Post. Both moves have been coveted for years by oil and gas companies, ATV riders ranchers, and “states’ rights” types in supremely conservative southern Utah. “They’re crying because they cant ride their four-wheeler over the countryside to destroy the Earth,” Shaun Chapoose, chairman of the Ute Indian Tribe Business Committee, told Earther. Trump has taken an unprecedented step to give the cry babies and fossil fuel corporations what they want at the expense of sovereign tribes and a large swath of the American public. No president has ever rescinded national monument protections for such a large swath of land, let alone against overwhelming public support. “Our precious national treasures must be protected and now they will be protected,” Trump said in remarks Monday that would’ve made Orwell proud. The move will surely be tested in the court of law and the court of public opinion—and it may very well lose on both fronts. “I’ve been digging for the last year to understand prior monument reductions and I’ve yet to find one that was done for such naked political reasons,” John Ruple, a law professor at the University of Utah’s Wallace Stegner Center, told Earther. The monument was designated by former President Barack Obama in December 2016 as one of his final decisions as president. Using the Antiquities Act, he set aside land that included sections that the Ute Indian Tribe as well as the Hopi, Navajo, Ute Mountain and Zuni tribes have lobbied for years to have the federal protection. Bears Ears holds spiritual significance to the tribes and contains 100,000 archeological sites that tell their history back to 12,000 B.C.E. Now Trump is attempting to undo much of that protection, slicing the monument into two, much smaller parcels of land. He touted his decision as “so important for states rights,” the face of which are ranchers and recreational vehicle riders. But the reality is Trump is using them as a smokescreen similar to how he’s using Appalachian coal miners to argue for deregulation. Make no mistake. This is largely about the corporations behind those faces, which stand to reap a huge financial windfall if Bears Ears’ protections are rescinded. Fossil fuel companies have wanted to tap more than 100,000 acres in the region for years according to the Salt Lake Tribune—part of a much larger 2.7-million acre swath of land dubbed the San Juan County Energy Zone, which the Utah statehouse would like to open up to more fossil fuel exploration. While Trump claimed setting aside Bears Ears was done “over the loud objections of the people in this state,” his announcement completely sidestepped the generational fight by tribes to protect the land for all Americans. Leasing that land would go against everything the tribes have fought for. That’s why the Bears Ears Inter-Tribal Coalition, which includes the five aforementioned tribes, views Monday’s decision as an all-out assault. She said the Navajo Nation and other tribes would file a complaint in court following any executive action. 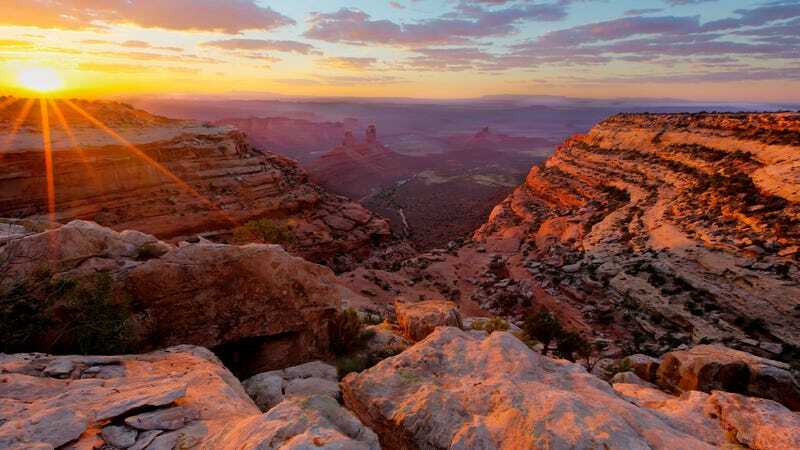 Conservationists and the outdoor industry will join them in the legal fight to preserve the majestic landscape at Bears Ears as well as Grand Staircase-Escalante. More than 120 law professors sent the administration a letter back in July stating that any attempts to the shrink monuments were likely illegal. The legal battle will likely settle around how the president can use the Antiquities Act, which came into existence in 1906 so President Roosevelt could protect tribal sites in the Southwest from looting. Since then it’s been used to set aside land across the U.S. for its cultural or natural significance. Bears Ears certainly fits the bill on both accounts. In addition to being a cultural touchstone for the tribes, a Center for American Progress analysis found that Bears Ears is has the darkest night sky and is one of the most ecologically intact and connected monuments of the 22 land-based monuments Trump is considering shrinking. Ruple said the only plausible argument the Trump administration could likely make is that in the rare instances when small changes have been made to monuments’ boundaries in the past, there were no legal challenges. But in those cases, there were also good reasons. Congress could intervene and shrink the monument with fewer legal roadblocks, something the Utah delegation would happily lead the charge on as some of the most vehemently anti-public land representatives in the House. Behind the legal tussle is an inter-generational struggle for justice. The U.S. government has treated Native Americans badly for hundreds of years, killing them, pushing them onto reservations, and exploiting their natural resources. Protecting Bears Ears for future generations was a small step in the right direction. It’s no surprise the Trump administration wouldn’t want to take it, and soon it will on courts to decide what’s right. Earther has reached out to the Department of the Interior for comment and will update this post if we hear back.